I remember the day I first played Galaxian quite vividly, back in the spring of 1980. I was 14 years old and had just gotten off of work at the local Bob’s Big Boy. It was a particularly rough day for me, having earlier asked Carmen Rosedale to the big spring dance and getting shot down in a blaze of non-glory. That would no doubt be the talk of school the following Monday, but, for the time being, I wasn’t going to sweat it. I had just gotten done with my bus shift after school and was headed to the local arcade for a late night romp before going home and starting my evening chores. I had $1.50 in quarters, and they were burning a hole in my pocket, deeper with every second that they weren’t in an arcade cabinet coin slot. I made my way over to Space Port, my local arcade over on 8th and Vine. The air inside, as was always the case, was thick with tobacco and marijuana smoke. Lights flashed all around me, sounds blaring from every corner. It was so exhilarating and disorientating at the same time, and I loved every bit of it. I started to make my rounds, the routine I had fallen into, checking out who was playing what and what was new that week. It was a fantastic time to be alive, and Space Port did a great job of making young, impressionable teenage kids feel very much alive. I saw “Stoney Brook” Calvin over on the Pong machine, and Gloria “Two-Tone” working the Skeeball. I saw Earnest and Baylor fighting over some hip new Spanish chick by the Centipede machine; nothing new there. Just then, a sound I had never heard before penetrated my ears and began calling to me from afar. A strange, mesmerizing siren’s call that let me know that somewhere on that gaming floor, there was a brand new game, and by George, I needed to play it. After making my way through the foggy haze of reefer madness and cheap polyester, I finally found what I was searching for: Galaxian. It might as well have been called Xanadu, for I had reached the top of the mountain and it looked very good indeed. The line was long, but I didn’t care. I was willing to wait an eternity to play anything new, especially if it meant bragging rights on the blacktop. And, not having noticed any faces from St. Balmer Junior High, chances were good that I was the first to be hip to this new machine. Those squares would be following my lead this time. It took about an hour of watching chumps come and go, rise and fall, but finally it was my turn. I only had about 25 minutes tops to play but I was going to make the best of it. Even if that meant having to sprint the 15 blocks from Space Port to my home in order to make my 9:30 curfew. I was immediately sucked in. The light show and sound effects and music hit me like a wave of rushing adrenaline. The hairs on my arms and neck stood up as I was tasked with destroying an onslaught of alien invaders. During those few fleeting minutes — which I had hoped would feel like an eternity but were more like a blink of an eye — a sensation had taken hold, a sensation like few others I had experienced in my life up to that point. I couldn’t care less about Carmen what’s-her-name. 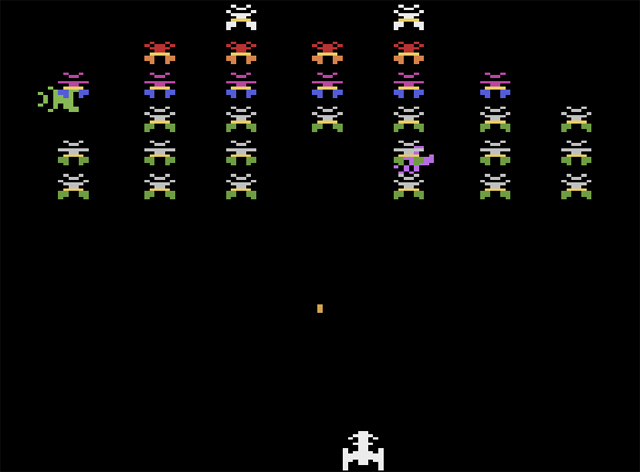 Galaxian was it, plain and simple. And then it was over. I fared pretty well, well enough to get a few accolades from some of the older kids. I even got to take a small drag off of a reefer stick. As I emerged from Space Port into the fresh cool evening air of small-town America, I felt that, for once, I had been a part of something cool. I may be returning to regular old Pete, faced with the daunting task of running 15 blocks in two minutes, reeking of grass and hoping my dad was in his den and not the living room, but for a brief moment, there I was, a space ranger fighting the good fight. I was born and did a of couple things. Then I was introduced to video games, which allowed me to do a ton of things. I currently do those things and write about them.